Expert PDF features all necessary tools to edit PDF files directly without the need to change the files format which may cause lost of formatting. 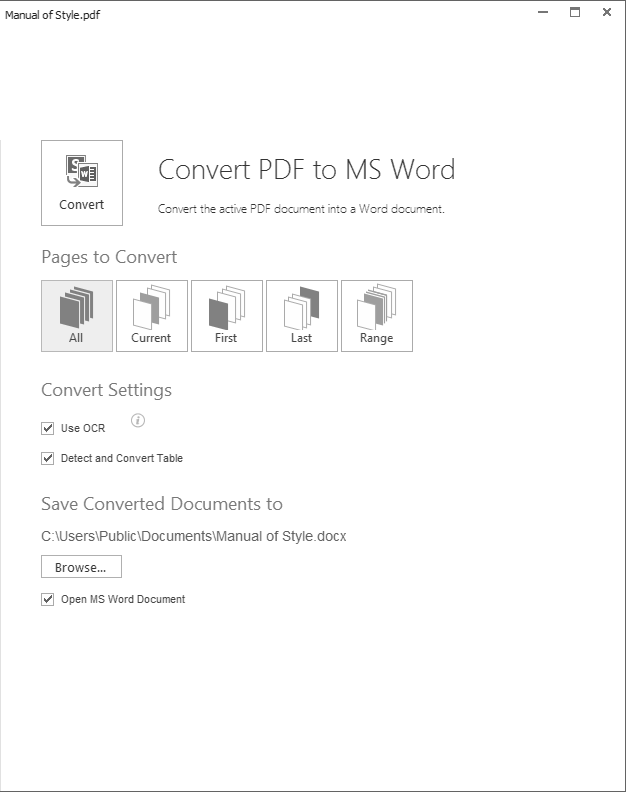 To convert the active PDF document into a Word Document (.doc or .docx, depending on the MS Word version installed on the workstation), use the PDF to Word button of the Convert group. In the dialog box, indicate the page range, as well as the file path for converting, then click the Convert button to start the converting process. If you have OCR Module activated, and your original PDF document has images that contain text, the application will extract this text while converting to a .doc(x) file format. In addition, the initial image will be preserved, and the text contained in this image will become editable. To do that, select the Use OCR check box under the Convert Settings block. Select the Open MS Word Document check box if you want the converted document to be open by the MS Office application. As soon as the conversion starts, the recognition process is displayed on the screen.